At AMD's Fusion Developer Summit 2012, the company announced a brand new, high-end workstation offering labeled the AMD FirePro W9000. 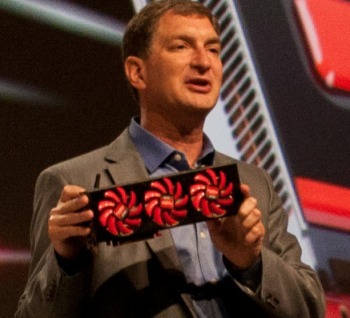 While the top-shelf graphics solution is a noteworthy announcement on its own, there was one curious inconsistency which caught the eye of PC hardware outfit Tech Report -- the graphics card held in the hands of AMD CTO Mark Papermaster looked markedly different than the one pictured in the keynote. Intrigued by this discrepancy, a Tech Report journalist asked AMD PR man Dave Erskine about the product being wielded by Papermaster during the presentation. Erskine's answer? The real-life graphics card sample was a "dual-GPU product that will be released later this year". This seems like a probable explanation given the length of the card and the fact it sports three separate fans. The past several months in the GPU wars have been unusually interesting with significant improvements made by both companies in performance, size and power consumption. We also saw Nvidia retake the performance crown with its line-up of Kepler GPUs with a special emphasis its thousand-dollar flagship product, the Geforce GTX 690. If AMD's dual-GPU offering ends up being based upon the same Tahiti cores found in the Radeon HD 7970, we can probably expect the Geforce GTX 690 to retain its well-deserved performance crown. The Geforce GTX 680 unit we reviewed last month, essentially a GTX 690 with a single GPU, edged out the Radeon HD 7970 in our benchmarks. Such a beastly graphics card from AMD would certainly put the company back into the highest of high-end tier once again, however.